Neglected for most of her career, Eileen Gray is now regarded as one of the most important furniture designers and architects of the early 20th century and the most influential woman in those fields. Eileen Grays work inspired both Modernism and Art Deco. She was to stand alone throughout her career first as a lacquer artist, then a furniture designer and finally as an architect. 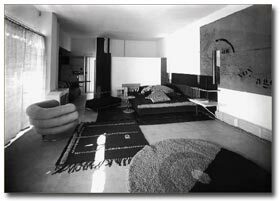 At a time when other leading designers were almost all male and mostly members of one movement or another Eileen Gray remained independent. Her design style was as distinctive as her way of working, and Gray developed an opulent, luxuriant take on the geometric forms and industrially produced materials used by the International Style designers, such as Le Corbusier, Charlotte Perriand and Mies Van Der Rohe, who shared many of her ideals. 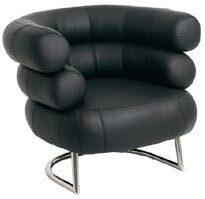 Her voluptuous leather and tubular steel Bibendum Chair and clinically chic E-1027 glass and tubular steel table are now as familiar as icons of the International Style as Le Corbusier and Perriand’s classic Grand Confort club chairs, yet for most of her career she was relegated to obscurity by the same proud singularity that makes her work so prized today. From County Wexford, Ireland Eileen Gray was born into an aristocratic family. She entered the Slade School of Art in London in 1898 and moved to Paris in 1902 where she spent the rest of her life, interrupted only by the two world wars. She was celebrated for her exotic use of lacquer, the technique that she learned from Sougaware, a Japanese master. Gray studied with Sugiwara for four years. Lacquer work was not only painstaking, but perilous. Like many people who come into close contact with it, she contracted a painful lacquer disease on her hands. She slowly refined her technique to create stark forms with simple geometric decorations. This simplicity was, however, as much a product of the complexity of the process as of Gray’s aesthetic preferences. It was not until 1913 that Eileen Gray felt confident enough to exhibit her work by showing some decorative panels at the Salon des Artistes Décorateurs. They attracted the attention of the Duchess of Clermont-Tonnerre and the couturier Jacques Doucet, who bought one of her panels at the Salon and commissioned other pieces of lacquer work from Eileen for his Paris apartment. Although Gray did not exhibit consistently at the Salons, she ran her own establishment, the jean Desert Gallery from 1922 until 1930. Gray’s furniture has been characterized as ‘luxurious and theatrical’ and the gallery never achieved commercial success, although it was supported by sales of her popular carpets. 1878 – Born Kathleen Eileen Moray, the youngest of five children, at Brownswood, near Enniscorthy in County Wexford, Ireland. The children are later renamed Gray after their mother’s wealthy, aristocratic family. 1900 – Studies at the Slade School of Art in London and visits the International Exposition in Paris with her mother. 1902 – Moves to Paris with friends from the Slade to continue her painting studies. 1905 – Returns to London to care for her mother during an illness, begins studying lacquer technique at a workshop in Soho. 1906 – Back in Paris she studies with the Japanese lacquer craftsman, Seizo Sugawara. The following year she moves into an apartment on rue Bonaparte. 1913 – Exhibits lacquer work at the Salon des Artistes Décorateurs and is commissioned by her first important client, the couturier Jacques Doucet. 1915 – Spends World War I in London with Sugawara working from a studio in Chelsea. 1919 – Returning to Paris, Gray creates her first complete interior for an apartment on rue de Lota, which leads to other commissions for lacquerwork and interiors. 1922 – Opens Galerie Jean Désert in collaboration with the architecture critic Jean Badovici to sell rugs, furniture and lighting. 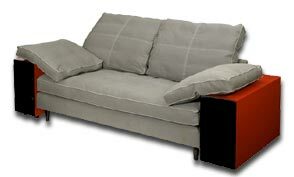 Introduces tubular steel to her furniture. 1923 – Exhibits the Boudoir-bedroom de Monte-Carlo at the Salon des Artistes Décorateurs. Encouraged by favourable press comment, she begins small-scale architecture studies. 1927 – Collaborates with Jean Badovici on the design of E. 1027, a house on the cliffs at Roquebrune near Monaco. 1930 – Galerie Jean Désert closes. Eileen and Badovici present plans for the now completed E.1027 at the first Union des Artistes Modernes exhibition. 1932 – Begins construction of her second house, Tempe à Pailla. 1937 – At Le Corbusier’s invitation, exhibits her plans for a Vacation Centre in his Pavilion des Temps Nouveaux at the Paris Exposition. Gray does not attend the opening and begins a long period of reclusion. 1940 – During World War II Tempe à Pailla is looted and the flat in Saint-Tropez where Gray stored many of her posessions is bombed. Isolated in Provence, Gray’s wartime work is limited to gouaches, unrealised architectural schemes and revisions of her furniture. 1954 – Begins construction of her third house, Lou Pérou, near Saint-Tropez. 1968 – After years of neglect, Gray’s work is the subject of an article by Joseph Rykwert in Domus magazine. 1970 – Exhibitions of Gray’s architecture are organised in Graz and Vienna. 1972 – The revival of interest in Gray is enhanced by an auction in Paris of the contents of Jacques Doucet’s apartment and an exhibition at the Royal Institute of British Architects in London. Zeev Aram, a London furniture maker, reproduces three pieces of her furniture. Art Deco Artists like Eileen Gray have produce some of the most sought after collectables of the 20th Century. Finding good quality examples though, can be difficult and expensive. 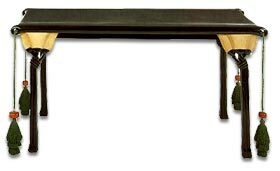 If Art Deco is your thing always make sure you are getting the genuine period piece you think you are.